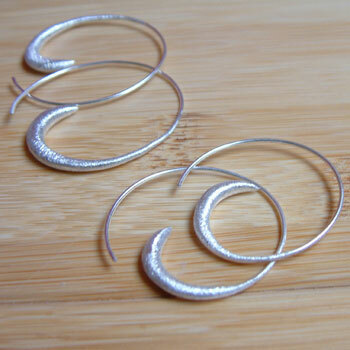 A Brushed Matte finish version of our top selling spiral hoops. The spiral is a very unique symbol spanning spirituality, mathematics and nature. Spirals are seen in diverse places from ancient celtic symbolism to chinese art and from spiral galaxy models to nautilus shells. 4.5 cm, 8 g Sterling silver. Made in India.